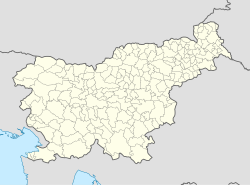 Prem (pronounced [ˈpreːm]; Italian: Primano) is a village above the left bank of the Reka River northwest of Ilirska Bistrica in the Inner Carniola region of Slovenia. The village was first attested in written sources as Prem in 1213 (and as Primo in 1234 and Prême in 1276). The name may be derived from the Slavic noun *prějьmъ 'that which is received'. If so, the meaning of the name would be similar to 'fief'; that is, land received for use from a superior feudal lord. Prem is the site of a mass grave and an unmarked grave from the end of the Second World War. They both contain the remains of German soldiers from the 97th Corps that fell at the beginning of May 1945. The Nogradec 1 Mass Grave (Slovene: Grobišče Nogradec 1) lies next to the road by the cemetery, in a former roadside trench. It contains the remains of 23 soldiers, as well as animals and military equipment. The Nogradec 2 Grave (Grobišče Nogradec 2) lies next to the first and contains the remains of a German officer. The parish church in the settlement is dedicated to Saint Helena and belongs to the Koper Diocese. ^ Snoj, Marko. 2009. Etimološki slovar slovenskih zemljepisnih imen. Ljubljana: Modrijan and Založba ZRC, pp. 329–330. This page was last edited on 9 April 2018, at 16:28 (UTC).